Pilgrims will hear testimonies of young Caritas volunteers and staff from Iraq, Venezuela, Lebanon, El Salvador, Senegal, Canada, New Zealand, Luxembourg and England. They will also have the opportunity to be part of a large group selfie taken by Cardinal Tagle. In a video message for World Youth Day Cardinal Tagle says, “History tells us that young people are the beating heart of society. This is true of the Church it is also true of the service of charity that Caritas stands for. The event will start at 3pm on 27th July at St Joseph’s parish church at Bieńczyce, osiedle Kalinowe 5, 31-812 Krakow. World Youth Day runs from 25th-31st July, with Pope Francis arriving on 27th. Pope Francis will launch and bless two Caritas projects on 31st July at WYD at the Campus Misericordiae: a Caritas home for the elderly and a large food warehouse. Both are intended as a memorial to WYD and the Pope’s visit to Poland during this special Holy Year of Mercy. 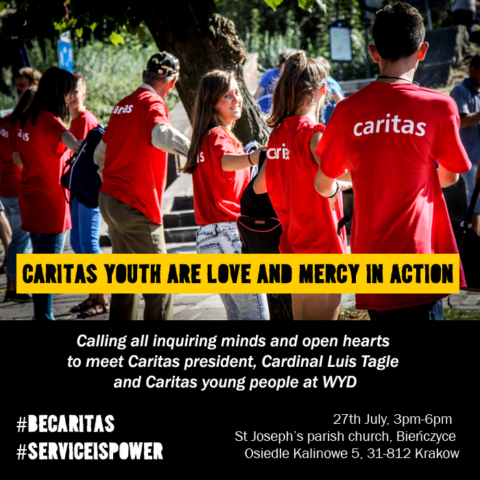 Caritas Krakow will ensure hungry pilgrims are fed by coordinating food-service zones and mobile food outlets during WYD. It has also launched a crowdfunding initiative to buy a mobile clinic for Syrian refugees.